The DNC family of families sure is growing! Eric and Sarah are due to welcome their little boy into the world in just a few months so the awesome ladies of the DNC here in Houston decided to give them a surprise baby shower this past weekend while some of the boys chimed in to help celebrate and watch a little football. We sure are raising an army of little ninjas around here! My, oh my, look how we’ve grown! Last Sunday, the families of the DNC met up for Sunday brunch at Lola in Houston’s Heights District after the Tribute ‘Bye Bye Blue House’ party, which marked an end to our Westchase headquarters and the last two years of DNC History. When I look back to the very beginnings of the DNC and compare it to who we are today, I can’t help but marvel at the progression we’ve made on a whole. As you can see by the slideshow below… all of us, both as a group and as individuals, have grown so much in the last few years. Yes, reality bites. And you know what? As each day passes and I see more and more people of my and the upcoming generation taking all the riches that our American world has to offer for granted, I start to seethe. After watching the movie, Reality Bites, I was compelled to write the below. If you haven’t seen this movie, it is basically a monument to the drowning cynicism and complete arrogance of the early nineties. The last time I saw this movie I was 18 and I thought it was profound and edgy. Now, 8 years or so later, I am just watching this train wreck of my generation’s pop culture with my mouth hanging open. It is not cool to abstain from being a productive and hopeful member of society! Why did we ever subscribe to this ridiculous way of thinking? To be fair, the movie is a parody of sorts on just this kind of thinking. It is pointing the finger at itself as much as anything else. However, in the midst of the sarcasm and tongue-in-cheek fun, a real message starts to come through. Try as they might, they weren’t able to escape the sense of entitlement and the too-cool-for-school cynicism that marked the early nineties…and only gathered strength as the years rolled on. The invincibility of youth is a powerful drug that rockets you to the highest highs and keeps you company through the lowest of lows. It is a beautiful ride, filled with dizzying drops and heart-stopping inclines. The comedown, however, can be a terrible thing. If you haven’t been paying attention, if you haven’t learned to look outside your self-centered bubble; it will give you a nasty, but ne eded wake-up call. It sneaks up on you around 24 or 25, give or take a few years contingent upon your personal level of maturity, and where you are in your life. The comedown is being forced to look at your future as it relates to reality. Remember when your parents repeated ad nauseam that, “Life isn’t fair.”? They were right. Again. Get used to the idea now, because it becomes a louder litany for every year you gain. Nothing is what you thought it would be and life is even harder than you knew it would be. Life (adulthood) isn’t just difficult because you have to work hard, pay constant bills, care about people who hurt you, let tightly clutched dreams go, or take responsibility for hurting people that you care about. Those things are just bit players on the stage of life. It is the moments in between that shoot your hair with gray and line your face with wrinkles. It is looking at yourself in the mirror every single morning and reconciling what is inside you, with what you see. It is in the fading but still visible scars that tell a story about a mistaken, drunken night. It is the very first time you fall in love with a child, protect them with all you have, then one day realize you may never see them again. It is facing your mistakes naked, with a cold and unforgiving eye. It is real cynicism, borne from life experience, that you fight with every bit of the child left inside you, because somehow you know that letting it take over would be like daily taking a little arsenic with your morning coffee. In the beginning, there are barely noticeable symptoms akin to a general unwell feeling and then, one day, you die a terribly painful death. It is the final, full acceptance that you absolutely will die, anytime and anywhere, for no reason at all. It is the death of one or both of your parents. Learning to live in a world where the people who made you no longer exist. It is caring for your elderly at a nursing home and knowing that it could very well be you, sitting alone in a darkened room refusing to shower one day… if you’re lucky that is. That is when life is truly hard. The heroes in this life are not the cynics, the artists and the empty, all-too-human, glittering celebrities we worship. The heroes are the people who take these harsh realities of life and turn them into a positive, even when it seems impossible. The people who find a reason to smile through adversity. The Gandhis, the Nelson Mandelas, the Martin Luther Kings of this world are the people to exemplify. Or the everyday hero. My personal favorite. The woman who still finds steel in her soul that allows her to smile and be gracious through the funeral of the only man she ever loved. The mom who loses her child but stays strong for the remaining ones. The fath er who goes to work every single day at a job he despises just to feel fulfilled when watching his children reap the rewards of all that hard work. There is such nobility in willing self-sacrifice. The bottom line these days is so much more centered around instant gratification or the pursuit of happiness. The simple but moving stories above are becoming less and less, fewer and far in between. The people who turn their constant worries into valid causes, that look at obstacles as an exciting challenge. . . these are the people who inspire and shame us all. The heroes rise above the pain of reality and do something about it. Not so are the people who embrace the cynicism, wearing it like a security blanket for all the world to see. Making jokes about hard working men and women struggling to feed their families, as if what they do is somehow less because they accepted the daily rat race or because they weren’t “cool” enough to get some job painting pictures for a living. You know, we can’t all be artists. Who would be there to appreciate that piece of work then? I think every self-labeled artist should profusely thank the average man and woman every day, because without them, all they’ve accomplished is putting some color on canvas or words to music that no one looks at and no one listens to. If we didn’t go to the movies, read books, drink wine, or attend museums… well, then where would the artists of this world be? So, to abstain from the rat race, to pursue culture, to be an artist is all well and good – great even! – but don’t for a second believe that it makes you better in some way or that you are nobler somehow. We all come from the same Earth, we all will return to it and we all make a difference in some small way. And I tend to believe that the humble, rough farmer does a great deal more than the Picasso’s of the world. As a child, I was always fascinated about the nature and history of the world and everything in it. As early as I figured out how to read, I took a huge interest in science, history, and all things non-fiction. Seriously, I had more encyclopedias and World War II archives around than childrens books as a kid. Anyways, this interest in the relevant and real never went away as I grew up. As a matter of fact, as time went by I only grew more interested in exploring it all. Fast forward to 2005, the year of my last summer trip to my hometown of Davao, Philippines. My extended family was kind enough to let me borrow a room at the family compound on Bonifacio St. in the middle of the city for the duration of my stay. I was free to come and go as I pleased and I did. I explored the city, saw family I hadn’t seen in forever, partied with my cousins, and generally had a really good time. That much was to be expected. What I didn’t foresee were the intrinsic rewards that came to me without ever having to leave the building at all. The first part of this internal gain was learning how to tend bonsai trees with my Uncle Bibo and Auntie Norma. That was an every morning thing routine for us while I was there. I’d get up in the morning, run up to the rooftop, and one of them would always be up there already. I was curious and they were always available to teach me things, whether it be how to manicure the tree, re-pot the soil, etc. So that satisfied my learning capacity in reference to nature and I enjoyed every moment I spent on that roof with my relatives. The other part of what I gained at Bonifacio has to do with my passion for history. You see, my grandparents (grand-aunts & uncle) had taken a lot of effort in showing me around the place after I arrived. I was exposed to family archives, documents, and photos that I’d never been exposed to before. And I learned a great deal about what my family went through during World War II, the last great war. On December 6 of 1941, troops from the Japanese Imperial Army invaded my home city of Davao in the southern island of Mindanao in the Philippines. The Japanese empire wanted to capture our particular city because it offered wartime resources in its proximity to Japanese naval bases and also because it would play a key role in isolating American naval and air defenses. Before the invasion it seemed that Davao was a fun place to be. It was the great city of trade in the south and had a particularly diverse population. At the time, Davao was teaming with Chinese, Japanese, and American ex-patriots, as well as the Filipinos of Spanish colonial heritage like us. My family, specifically that of my maternal great-grandfather Anastacio Campo, was in the center of it all. As Provincial Commander of the City of Davao, he was firmly entrenched in local politics. Aside from his municipal duties, he was also a farmer during peacetime, much like some of my family still is today. He and his wife. along with their nine children, lived a fairly normal and fortunate existence. Any sense of normalcy they had changed when the war started. Following the Japanese invasion, my great-grandfather immediately joined the United States Army Forces of the Far East (USAFFE), which was organized by US President Franklin Roosevelt in July of 1941. It was then that they became crucially involved in a very integral part of the shared history between the US and the Philippines. They worked feverishly during the war as part of the liberation movement against the Japanese invaders. Those in our family participated in many heroic and dangerous acts during the war such as: entertaining and supporting American POW’s in the Japanese prison camps, passing vital information to allied forces, and aiding in the release of American and Filipino prisoners of war. For these acts, my great-grandfather suffered at the hands of the brutal and feared Japanese Kempetai, who tortured him up until he was almost dead for information he never divulged. Just recently, I had the joy of learning that a film based on my family’s history in Davao was produced. This movie, Concerto, by Paul Alexander Morales, has been featured in Politics on Film and has received nine nominations for the sixth Golden Screen Awards. Below is the additional information about the film. IMDB: Concerto is about how, in the last part of World War II, a special piano concert is held in the forest outside Davao City, in Mindanao. In these boondocks, a displaced Filipino family, lead by Military Commander Ricardo and his wife Julia, become acquainted with a group of Japanese officers, similarly camped nearby. Their son Joselito, a Japanese speaker, becomes the conduit with the neighboring Japanese. Their daughters Niña, an aspiring concert pianist and the musically gifted, Maria, who is able to play by ear, are alternately repulsed and intrigued by the officers. Family values are questioned as the family treads the thin line between enmity and friendship with the occupying Japanese. Based on true stories from the director’s own family history, Concerto celebrates a family whose reverence for life, expressed through their love of music and friendship, can survive even war, and shows how beauty and compassion does grow in even the harshest of conditions. 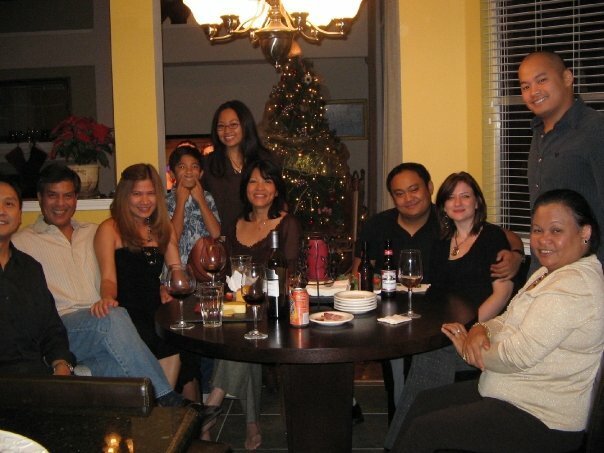 From singing at the Simpsons to music and Manny at the Marasigans, Thanksgiving 2008 was an excellent time well spent with my beloved family. Forget the tryptafan! It’s not all the turkey’s fault… We have some terrific cooks in our family that would make any turkey pass out. And like every other year, my narcolepsy was largely self-induced by a stomach sucking down everything in sight and a hunger to match. I think that Uncle Tony, Uncle Nap, Dad and their spouses can probably party harder than I can at this point. At the allegedly peaking age of 27, I’m not so sure I can keep up with those guys and their Las Vegas stories. We sure know how to raise’em! While visiting the Marasigan’s for the first time in ages, I learned that my cousin Troy played Carnegie Hall in New York City this past September while also accomplishing a Top 10 finish in the nation with his AAU basketball team. Props on coaching (and parenting) to Uncle Tony and Aunt Joanne! Miss you guys! How was your Thanksgiving this year? Sunday November 2, 2008 – while I was working at Open City Bistro I received a phone call @ 10:11pm from my mother crying, she said ” Chea` my momma is dead”!! Right then and there I broke down in front of the police, co-workers, customers, bar-backs and all. For at that moment I felt my soul leave my body leaving me powerless and feeling so very helpless. Im thankful my mother had the courage to call my sister and brother-in-law before she called me and have them in route to where I was, for she knew this was news I could not handle alone. I would like to thank all the well wishers from BONA Fitness, Elite Martial Arts, Open City, Union Bar, Zepplin, Pandora, Epic Lounge, Pravada (formerly) Crome, DECO, and all those who I missed thank you!! i know I have to be strong right now….if not for myself for my mother who is hurting the most!! Death is more universal than life; everyone dies but not everyone lives. Luv you grandma! I hate you missed history in the making!! The family enjoying post-dinner wine and storytelling. My sis took everyone’s money in Poker. My cousin Sam, broke at the poker table. An empty house as everyone sleeps. A sober Mike & Kris with a tipsy Mom and Aunt. Aunt Grace’s nanny, Lilly, making turkey pot pie. Uncle Ed and Aunt Kitty.